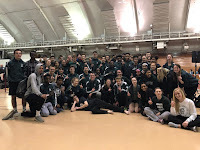 On Saturday the Madison Memorial track & field team split its squad sending a handful of girls to UW-Whitewater to compete in the TFA meet while the boys stayed in Madison to compete in the Madison West Relays meet at the Shell. For both teams this was their last indoor competition as both athletes and coaches look forward to the outdoor season beginning next week. The season is going to get very busy, very fast and the next six weeks are going to buzz by. It is time for ALL kids to show what they are made of and put in their hard work daily to get the most of this season. BE READY! The TFA meet has gone through many transformations over the years moving from Madison to Whitewater and changing weekends from year to year. The meet was once widely known as the indoor state meet due to the wide variety of high quality competition at the meet. While some teams are now missing from this meet the competition level is still very high. Shot putter Holly H scored points with a PR heave of 37' 4.5" which placed her 7th at the meet and 9th on the D1 state honor roll. 55m Hurdler Phibi M set a PR in prelims to qualify for semis and then improved her PR again to 9.42 to finish 14th overall. Soph Julana DW also set a new PR in the 55m dash finishing in 7.79. It was a nice finish to the indoor season for the girls and everyone got to see some great competition. The boys headed to the West Relays meet on Saturday and were permitted to competing athletes in both the "B" session which was the "small" schools in the morning and the "A" session which was the "large" schools in the evening. It was a busy and eventful day for the boys all day long. During the morning session, freshman Lance D scored in the 400m dash running a 56.67. While PR's were set by Dondreon C in the 55m dash (7.02), Cortez T in the 55m hurdles (9.93), and Jared G in the 3200m run (11:36.51). In the afternoon session, the team was led by a Jezell T who leaped a new PR in the long jump to win the event. His jump of 22' .5" moves him into 3rd on the state honor roll. Jake A placed 4th individually in the 200m dash with a time of 23.65 and combined with Jezell, Ean M, and Kaydee S to place 4th in the 4 x 200 with a time of 1:35.39. The 4 x 100 relay team of Jake A, Hunter P, Ean M, & Jezell T placed 8th with a time of 46.09. Some nice PRs were Kaydee S in the 55m dash (6.91), Casey GT in the 1600m run (5:04.78), and Zach H in the 800m run (2:08.16). The boys performed great at both sessions and now turn their attention to the the outdoors. Rain in the forecast all week...have appropriate clothes to practice and compete in the rain....and plenty of extra dry clothes too! !